The Dance 411 award-winning competition & performance company has competed (and won) against many of the best dance schools nationwide with show-stopping performances that WOW the judges and crowds! We’ve also performed on national television commercials, music videos, tours, films and more! 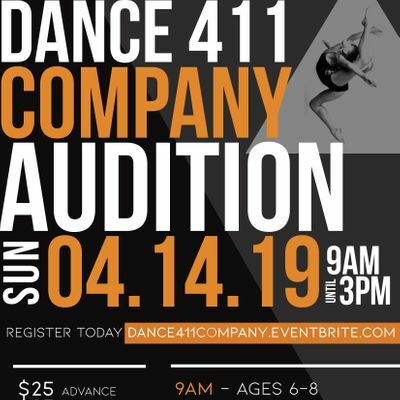 We encourage every eager child & teen dancer aged 5 to 18 to come audition and apply for Dance 411 Company. We have varied performance team program levels, and typically accept those students that demonstrate an ability to grow and learn. Advance $25 per participant. Door $35 per participant. Details: Observers are not allowed at this event; parents/guardians must wait in the designated holding area. Participants must audition with group that matches their age as of April 14th, 2019. Participants should be prepared to audition with an upper age group if invited by judges. Results will be communicated via email within 3-4 weeks of the auditions. Members learn teamwork and relationship-building, peak performance, how to gain a competitive edge, audition skills, overcoming nerves, focus, balance, control, restraint, respect, stage presence and presentation, attention to detail and professionalism. Your child will receive the best dance training from true working professionals in the entertainment industry in the areas of acro, ballet, jazz, lyrical, tap, and Dance 411’s famous claim-to-fame … the nations best hip-hop! Does your child have that little extra something? If so, Company members get noticed a lot! 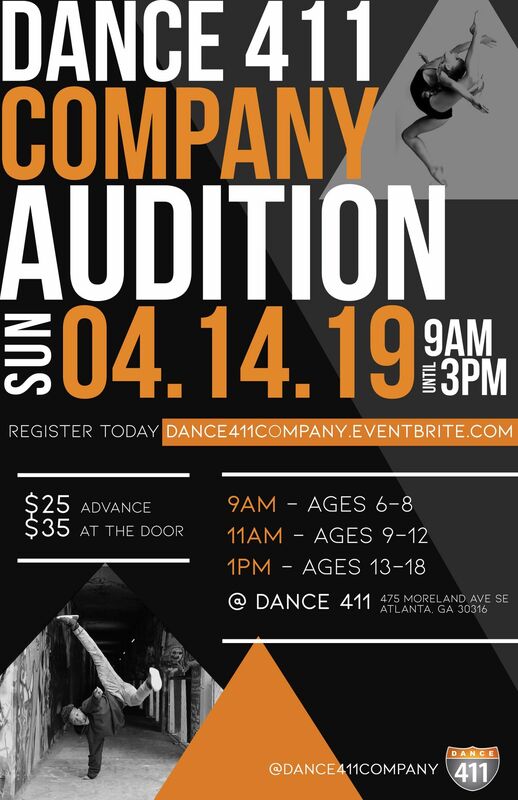 Some of our very best Dance 411 Company talent, if desired, has the opportunity to get signed to 411 South Talent for professional representation to work in the booming film, TV and music industries, and get seen through 411’s cultivated contacts in entertainment. 411 creates superstars! To be considered, all potential members must audition and apply. Dance 411 has a very well-respected reputation, and it is considered a great honor to be a part of our prestigious Company. What age group should I particpate in? Please register your dancer for the age group using their age on the day of the audition. Do we need to prepare a dance ? No, Dancer will particpate in a class style audition that covers hip hop and technique. Particpants will be give choreography to learn. Dancers should be prepare to show acro, tricks, tap, and alternate styles of dance upon request. * What do I need to wear to the audition ? Yes, you will need a printed ticket or an electronic/mobile version of your ticket, with the barcode clearly showing at-the-door scanning. DO NOT FORGET YOUR TICKET. Your admittance may be denied, and there are no refunds once you have registered for the audition. YES, but we encourage pre-registration. Please arrive 30 minutes in advance for door sales. You must arrive a minimum of 15-minutes early to sign your waiver and release and your electronic results form. Particpants under 18 are REQUIRED to be checked in by Parent or Gauardian over 18. Our parking lot space is very limited, so please arrive early in anticipation of any parking delays. Additional parking at the corner of Gleenwood and Moreland Ave.
* Are there ID requirements or an age limit to enter the event? Minimum age is 18 to attend the event. Under 18, parents must be present to sign in. Nope. The audition is closed. Please write reviews about us at dance411reviews.com. Tell your friends and family about us through social media. Tweet #dance411 and tag @dance411 in your postings. Take Instagram pictures of you and your friends before or after class, and add #dance411 and #whatsthed411 or @dance411 to your photos before posting. These things go a long way in helping us stay on top. Thanks!